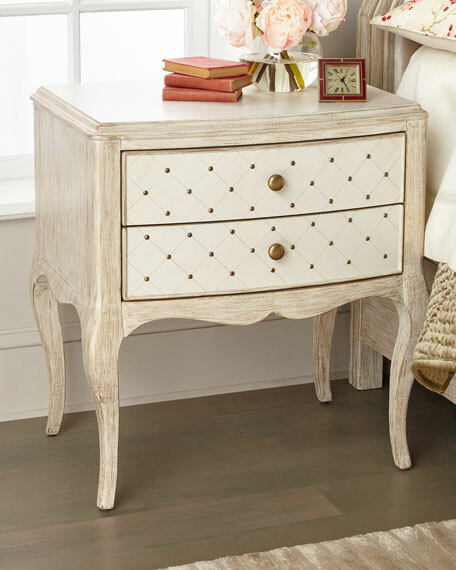 Polished and sophisticated, this dresser captures the essence of contemporary styling. 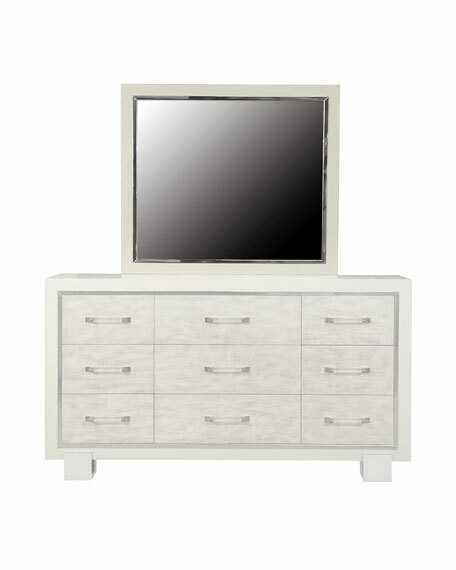 The beveled mirror is framed with cream and silver. Wooden supports are included for attaching to the dresser. 42"W x 1.5"D x 38"T.
Boxed weight, approximately 52.8 lbs. 64"W x 92"D x 64"T.
Boxed weight, approximately 217.1 lbs. 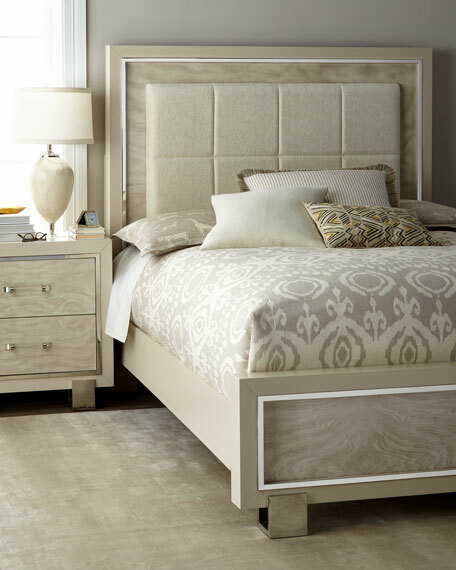 Polished and sophisticated, the Cydney collection captures the essence of contemporary styling. Cream colored cases are counter-pointed with chrome finished trim and feet, dramatic swirley white ash veneers, and a high gloss finish. 80"W x 92"D x 64"T.
Boxed weight, approximately 255.5 lbs. 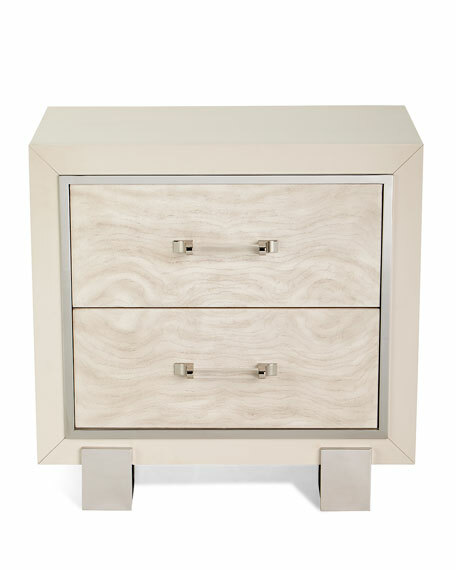 80"W x 96"D x 64"T.
Two-drawer night stand with acrylic hardware. Top drawer has a felt bottom; bottom drawer has cedar. Chrome finished trim and feet. Poplar solids and swirly white ash veneer. 30"W x 17"D x 29.5"T.
Boxed weight, approximately 97.9 lbs. 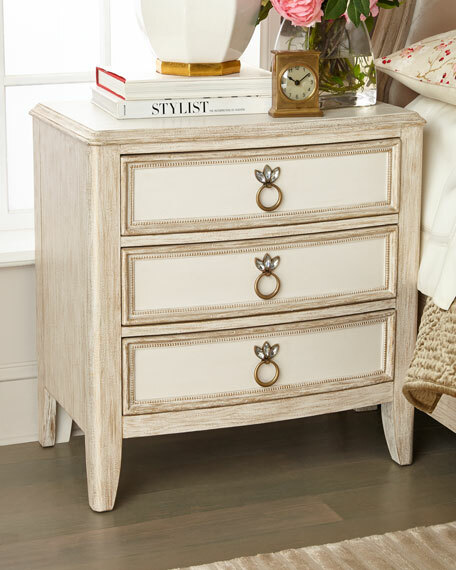 Polished and sophisticated, this chest captures the essence of contemporary styling. 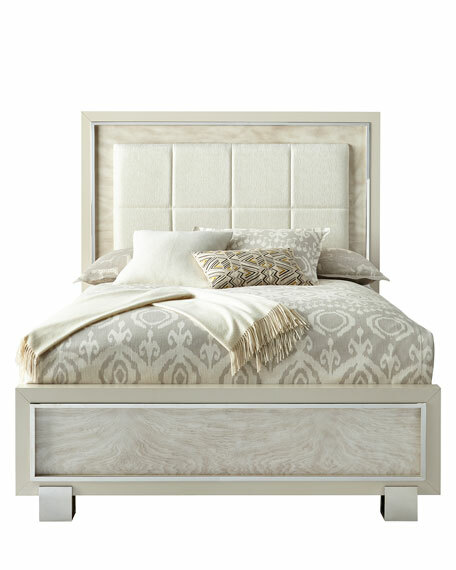 Cream colored cases are counter-pointed with chrome finished trim and feet, dramatic swirly white ash veneers, and a high gloss finish. Acrylic hardware brings the look home. 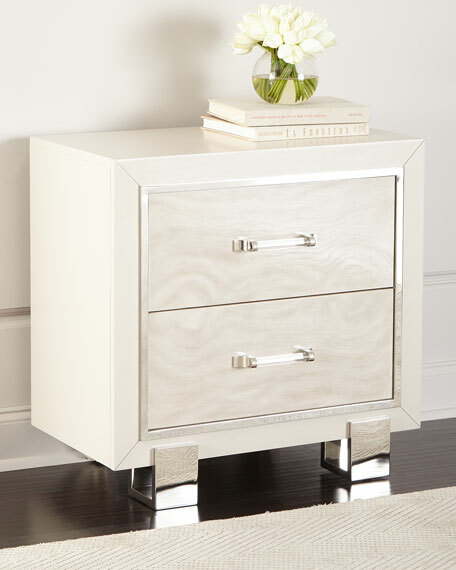 The chest offers five drawers for ample storage. Felt bottoms in the top drawer and cedar in the bottom drawer help protect clothing. 42"W x 18"D x 56"T.
Boxed weight, approximately 242.1 lbs. 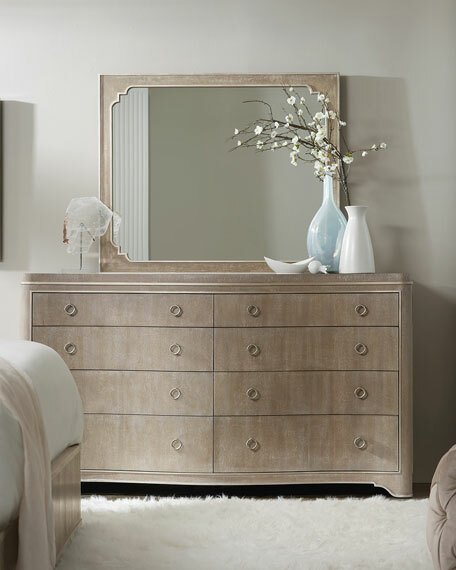 Polished and sophisticated, this dresser captures the essence of contemporary styling. 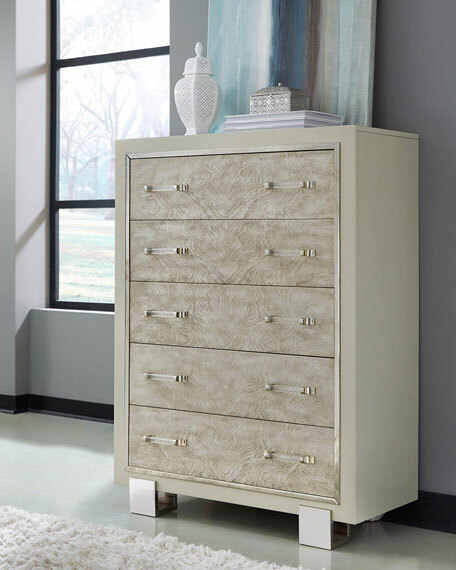 Cream colored cases are counter-pointed with chrome finished trim and feet, dramatic swirly white ash veneers, and a high gloss finish. Acrylic hardware brings the look home. 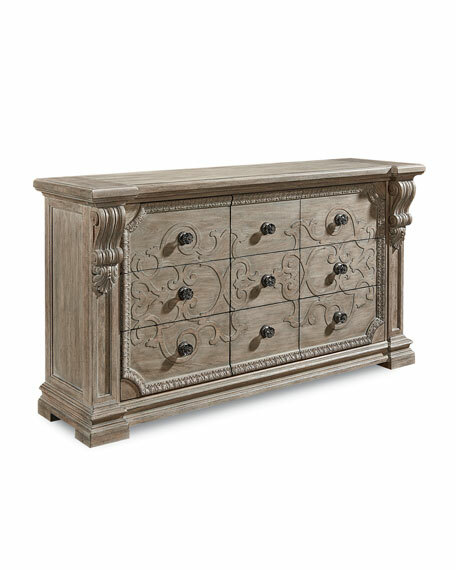 The dresser presents nine drawers for ample storage. 66"W x 18"D x 38"T.
Boxed weight, approximately 286.1 lbs.